Caramel gets me every time. If there's a dessert option that involves caramel, I'm most likely to choose that over any other dessert. There's something about creamy, butterscotchy, sticky caramel that just really makes me happy. Oh, and if sea salt comes into play, I giggle inside. Yum. I've been looking for a dessert that involves caramel but had limited ingredients and time on hand. That's when I came across the recipe for these Caramelita Bars. Not only does it use common ingredients you may already have in your baking pantry, it takes no time at all to make. This dessert bar of oatmeal and chocolate with swirls of caramel are just too hard to resist! My wine group here in Chicago (What's Pouring, Chicago) started up our annual summer concerts in the park not too long ago. At these concerts, folks come out to the park with their favorite wines, some snacks to nosh on and we share our goodies with each other. It makes for such a fun and delicious time while we listen to the free classical music concerts. I prefer bringing food to these events since there is always more than enough wine to go around. (It is a wine group, naturally.) 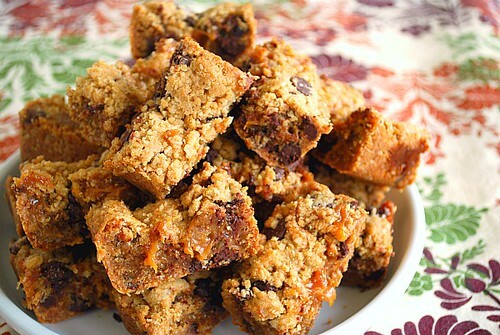 So along with my crackers, cheese and fruit, I made these dessert bars as well. They were a hit and were gone in no time. These Caramelita bars do come with a warning though. They are extremely sweet so it's best to cut them up into bite size pieces. The caramel holds everything together ever so sweetly while bittersweet chocolate chips are studded throughout. You can include chopped nuts such as pecans or walnuts, but I omitted them from the original recipe. Preheat the oven to 350 degrees and grease a 9" x 13" baking pan; set aside. In a large bowl, combine the flour, oatmeal, brown sugar, baking soda and salt. Slowly add the melted butter and beat into the dry mixture until fully incorporated. Take half of the mixture and press it into the bottom of the greased baking pan and bake in the preheated oven for 10 minutes. Do not turn off the oven. Remove the pan from the oven. Drizzle the caramel over the baked streusel layer. Sprinkle the chocolate chips over the caramel and top with the remaining portion of dough. Bake for an additional 15 minutes in the oven. Dreaming of one or two of these with my morning coffee! These look so delectable, im sure they taste absolutely irresistible :) i think im slightly addicted to bar recipes, such delicious results for so little effort! So decadent and so good! Wow those look incredible. I really want something caramelly now! Yum! Oatmeal? Chocolate? And swirls of caramel? You described everything I love in one delicious looking dessert bar! I made these to take on a friends boat over 4th of July weekend. They were a HUGE hit. I will be making these again soon!